One way to get the maximum benefit from an oven is to have one that is installed in a cabinet. Building a wall oven cabinet will vary according to the dimensions of the oven, but there are some basics that are true for every wall oven cabinet that is built. They all have storage space above and below the oven that can be customized to user specifications. This article builds a wall-oven cabinet 30-inches wide. 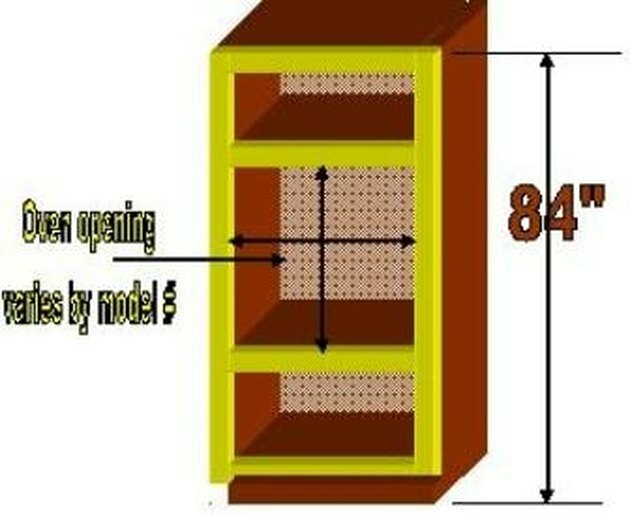 Place the two 84-inch end panels on a worktable. Measure from one end and make a mark at four inches. Repeat this for the perpendicular edge. Place the framing square on the marks and draw lines that will intersect. This will result in a four-inch square at one corner of the plywood. Repeat this on the other piece, and cut the squares out with the skill saw. Apply glue to the area behind the cutouts and secure the 4-by-19-inch pieces with the box nails. Clean up excess glue with a damp cloth. Measure from the top edge of the plywood and make marks at 28 and 73¾ inches. Place the framing square on the marks and draw a line across the width of the end panel. Mark an "X" to the right of the lines, indicating where the shelves will be secured. Apply glue to one long edge of the shelf supports (4-by-28½) and secure them to two of the shelves (23-by-28½) with the drywall screws. These two shelves are the center shelves. Next, apply glue to the 23-inch edges of the shelves, place them on the lines and secure them to the end panels with the finish nails. Turn the wall-oven cabinet over, so the toe-kick cutout is facing down. Apply glue to the edges, and place the 30-by-80-by-¼-inch plywood on the cabinet and secure it with the box nails. Place the two end-face frame pieces (1-by-2-by-80¾) on the worktable with the long edges adjacent to each other. Measure from one end, and make marks at 28 and 73¾ inches. Place the framing square on the marks, and draw a line across the width of the two pieces. Apply glue to the end edges of the bottom rail (1-by-2-by-27-inch lumber) and one of the top rails (1-by-3-by-27-inch lumber). Place the 1-by-2 at the bottom of the cabinet (the toe-kick end) and the other at the opposite end. Secure these pieces with the corrugated fasteners. Clean up excess glue immediately with a damp cloth. Apply glue to the end edges of the remaining rails, and place them on the lines drawn in Step 1 of this section. Secure them with the corrugated fasteners. Turn the wall oven-cabinet over, so the toe kick is facing up. Apply glue to the face edge of the toe-kick cutout, place the 4-by-30-by-¾-inch plywood on it, and secure it with the finish nails. Place the 4-by-4-by-¾-inch block behind the toe kick and secure it to the bottom of the bottom shelf with the drywall screws. Be careful not to puncture through the top of the bottom shelf. Drive two finish nails through the toe kick into this block. This block strengthens the toe kick during installation. Clean up excess glue immediately with a damp cloth. Apply glue to front edges of the wall oven cabinet, and place the face frame on it. Secure the frame to the cabinet with the finish nails. Set all the nail heads, and fill the holes and the frame joints with wood putty. After it dries, sand the cabinet with 100-grit sandpaper.